David Lynch almost directed Return of the Jedi. Yes, it's true. Who knows what George Lucas was thinking at the time. But Lynch did meet with the creator of the Star Wars franchise. And as David tells it, the experience gave him an immediate headache. There was no way this was happening. And it didn't. But it's interesting to think about what could have been. This past Sunday, the Twin Peaks saga came to a close after 18 amazing new episodes. All directed by one of the two masterminds behind the cult series, acclaimed filmmaker David Lynch. And it still has fans confused, elated, and debating what it all means. David Lynch and co-creator Mark Frost are auteur artists in every sense of the word. And what they pulled off is as audacious as anything that has ever been attempted before. It's true art, and something we don't often see in this era of come-and-go fast food franchises. The end of Twin Peaks and its singular artistic voice comes at an interesting time, when a lot of studios, not just Disney, are getting rid of auteur directors in favor of studio hires who will do everything the studio says. Yes men. As we witnessed this week with the firing of Colin Trevorrow on Star Wars 9. Lucasfilm is done with auteur directors. But interestingly enough, the greatest auteur director of all time, David Lynch, was actually wanted for 1983's Star Wars: Return of the Jedi. Yes, you heard that right. The guy behind Blue Velvet and Eraserhead was wanted by George Lucas to helm the third and final chapter in the original trilogy. And Lucas set up a meeting that David Lynch agreed to. Even knowing that he'd most likely turn it down. David Lynch would eventually go onto directed the big screen adaptation of Dune a year later. Lucas knew the director was eyeing that as a potential project, and thought he could tackle the Star Wars franchise. 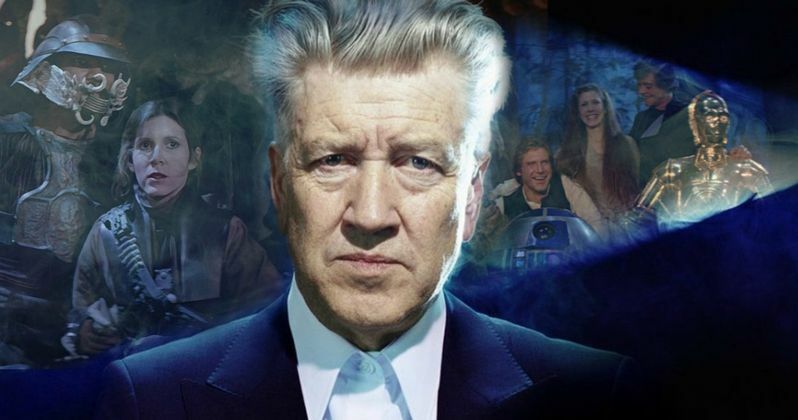 In a very funny retrospective interview from 2010, David Lynch himself confirms that he almost entered the Star Wars universe. But he realized very quickly upon meeting George and looking at a few Wookies, that this was not a job for him, no matter how many millions of dollars he would net from the experience. Say what you will about Lynch's work, but the man has integrity. He says this in a 2010 interview shared by Hudson Union Society Youtube. "I was asked by George to come up and see him and talk to him about directing what would be the third Star Wars. And I had next door to zero interest. But I always admired George. George is a guy who does what he loves. And I do what I love. The difference is, what George loves makes hundreds of billions of dollars. So I thought I should go up and at least visit with him. And it was incredible. I had to go to this building in L.A. first. And I had to get a special credit card, and I had to get special keys. A letter came, and a map. Then I went to the airport, and I flew up. They had a rental car all ready for me. Keys. Everything was set. I was to drive to this place. I came into an office. And there was George. He talked with me for a little bit. Then he says, 'I want to show you something.' Right about at this time, I started getting a little bit of a headache. You know what I'm talking about (laughs), okay...He took me upstairs. And he showed me these things called Wookies. And now this headache is getting stronger. He showed me many animals and different things. Then he took me in a ride in his Ferrari for lunch. And George is kind of short. So, he had the seat back, and he was almost laying down in the car. And we were flying through this little town up in Northern California. We went to a restaurant. Not that I don't like salad. But that's all they had was salad. Then I got a really...almost like a migraine headache. And I could hardly wait to get home. Even before I got home, I kind of crawled into a phone booth, and I called my agent and said, 'There's no way! There is no way I can do this!' He said, 'David, David, David...Calm down! You don't have to do this.' So George, bless his heart, I told him on the phone the next day that he should direct it. It's his film. He invented everything about it. But he doesn't really love directing. So someone else did direct that film. But I called my lawyer and told him I wasn't going to do it. And he said, 'You just lost, I don't know how many millions of dollars.' But it's okay." It's not hard to imagine what Return of the Jedi would have looked like had David Lynch directed it. It would look exactly as it does now. Because George was a shadow director in every sense of the word, looking over the shoulder of Richard Marquand (who eventually took the job) at every twist and turn. In all likelihood, had Lynch accepted the job, he probably would have been fired in a similar fashion to Phil Lord and Chris Miller, who were booted off the upcoming Han Solo movie after they'd already filmed a great portion of it. Lucasfilm is having a real problem keeping its directors in place. The Han Solo guys were booted, Star Wars 9 lost Colin Trevorrow. Boba Fett lost director Josh Trank. Rogue One ditched it's director in the post-production process. It's become clear that Star Wars is a giant machine and not meant for someone who has an 'artistic' vision. It is what it is. And it doesn't need an auteur behind it. Though, it's interesting to note just how far back the willingness to let well know artists play in this sandbox stretches. Perhaps one day, when people are exhausted from all the Star Wars spin-offs and sequels, they'll let someone with a creative streak have some fun. Until then, we'll get more of what came before. You can watch David Lynch's interview in the embed below.